I wrote the following words a few years ago as a guest post on a blog called Roots of She (it's no longer out there). I came across it again recently and the words rang so true inside me as I read them that I knew I wanted to share them here. Writing the true stories, using a prompt like "I ignored you," is how I water my mama soul. I hope it inspires you to write your own true stories. To get them out of you and onto paper, even if you don't share them with anyone. We simply let in more light, create space for more joy inside us, when we tell the true stories, even when (perhaps most importantly when) we're telling them to ourselves. And I'm pairing these words with two self-portraits I took back in 2010...when the uneven line was fresh on my body. When I was almost disappearing into the role of motherhood and caretaker. When I was diving deep into my self-care and self-love toolbox to feel seen. Self-portraits are another powerful way I unearth the stories inside me. Note that this post is about my cesarean scar, which feels important to share in case it is a sensitive subject for you. For months, I ignored you. I tried to pretend you did not exist. But then there would be a pull or a twinge or a pain that seemed to come from the center of me and I would remember you. You, the scar across my abdomen that birthed my daughter. (That birthed me.) The scar across the abdomen, the core, the womb inside me that had housed her, connected me to her, protected her for almost 10 months. I ignored the core of me that you decorate with your uneven purple fading to creamy pink line. I ignored you. And with that decision I ignored part of me. I pretended you (we) weren’t even there. And I did this for self-preservation really. I had a job to do. One that involved taking care of a baby girl who would have open-heart surgery at four months old. And I had a business to run. And I needed to ignore you. I was focused on her heart (holding my heart together), and I couldn’t think about you. Every now and then, I would talk about you, telling pieces of the story to a few trusted souls. Just here and there. Sometimes through tears. Sometimes through sobs, I shared pieces of the story. Then the day came where I told the whole story. Looking up at the ceiling with my foot tapping and my breath almost stopped, the words it really was trauma and why did this happen and they just keep telling me to be thankful we are okay but she wasn’t okay really and I fear getting pregnant again so much I can’t breathe poured out of me as my foot tapped on the beige carpet and I almost held my breath because if I didn’t the words wouldn’t all come out. I told the story. Your story. My story. I told it as the space was held. Those were the words you, my body, my core, my center, said to me as I sat in guided meditation listening after the truth poured out of me. From this moment of listening, a practice was born: Breathing all the way down into my belly until you were forced to expand and move and we could both begin to let go. Five deep breaths in between nap times and reading Goodnight Moon for the twenty-second time in an afternoon and projects and quick meals and walking in the park as the dahlias stretched toward the sun. Five deep breaths all the way into my belly. This practice was slow and often beautiful and gave me the gift of noticing all of me, noticing you, in the moments between all that a day holds. The layers between us began to shift and shed. But still there would be a twinge, a pull, a reminder that I might never feel whole again. I laughed all the way down into my belly until my whole body was shaking with the silliness and the beauty, until tears of actual joy pooled in my eyes. Laughter full of so much realness and truth and sound that it shook something loose inside my core, inside my center. It shook something big loose as it tucked joy right inside my heart. And I thought about you as I stood in the kitchen of that cabin in the woods and listened to their laughter. I thought about how something I thought you had locked away had been awakened by the sound of joy. In this moment, today, I stand naked in front of the mirror in my bathroom. I close my eyes and I hear the memory of their laughter, my laughter, and it echoes as it rattles around inside me. And then I hear Maya Angelou when she stood on the stage in March and sang, “I shall not; I shall not be moved. Like a tree planted by the water, I shall not be moved.” I hear her just as I did as I sat in the audience and felt those words cloak me with a shawl of hope. I hear her, I hear their laughter, I hear my own truth singing within me, and I open my eyes as I clasp my belly. There you are. You, the scar across my abdomen that birthed my daughter. (That birthed me.) The scar across the abdomen, the core, the womb inside me that had housed her, connected me to her, protected her for almost 10 months. The scar that houses trauma, sadness, and more love and joy than I thought possible (for me, for her, for us). 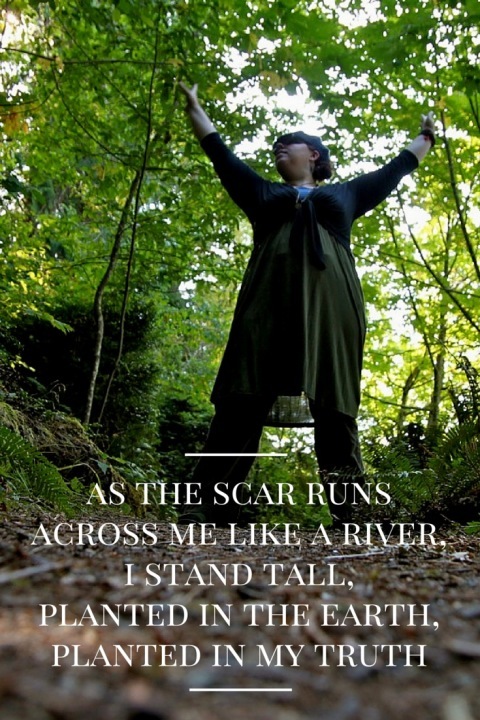 The scar that runs across me like a river, as I stand tall planted in the earth, in my truth. If you're looking for a way to tell the true stories, my book Inner Excavation is one place to begin. It is full of prompts to help you explore your stories through self-portraits in photography, poetry, and mixed-media art. You can read more about it and order a signed copy from me right here.